Please sticky this thread and put it on the main site please. 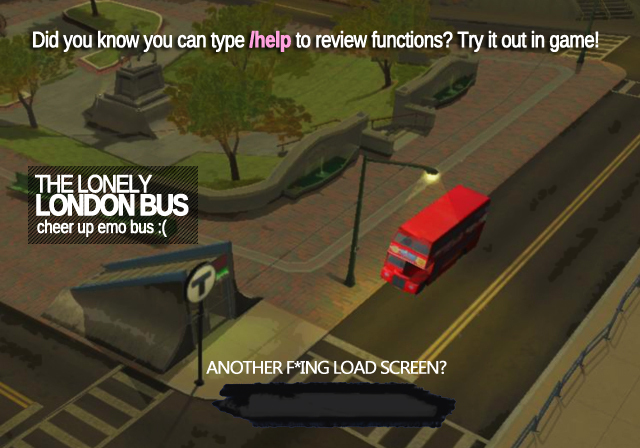 Guess why the london bus is so lonely by looking at the first picture for random funnizles. 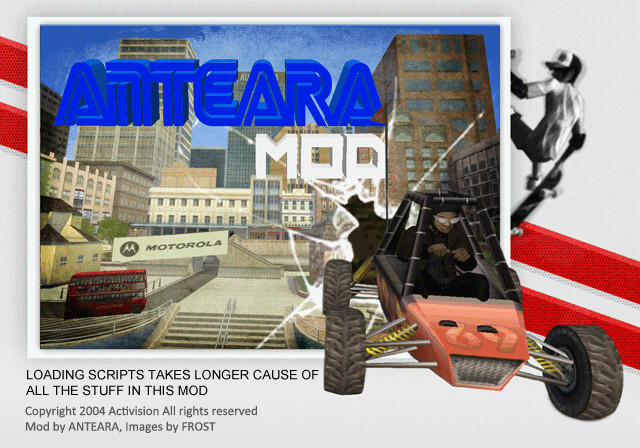 ANTEARA MOD, made by Anteara, is a brand new mod for THUG2 that contains features never seen before in any other public mod. Anteara Mod includes a unique feature that no other mod possesses, it has a 'sandbox' scripting mode, which means that YOU can add your functions to Anteara Mod simply by adding your functions to the qb file (or files if you add more) in Game/Data/Sandbox. You can access these functions by typing /sandbox in game. //If you don't understand what the above means, it means that it will work with your 1button ddscripts and buttslap counters etc... to load automatically in the anteara mod making the possibilities endless, this is also to make it compatible with the level editor by morten to be released shortly. Do NOT use any animations, vehicles or cars while online with anyone that isn't using Anteara Mod. This will cause them to crash, and if you intentionally crash someone, you will be permanently banned from playing THUG2 Online. If you would like to use vehicles or animations by yourself, create a new server, put a password on it, and do whatever you want. If everyone in the server is using Anteara Mod or one of the other mods listed above, then you may use animations and vehicles. If you want to play a game with others but you don't know anyone else to play with, simply make a server, and set "cars" as the password. Anyone with Anteara Mod will know this password and they will be able to join your server without you crashing them. -Cars are broadcasted online, this means others will see you driving your car and you can see their car. -Screen Menu is SAVEABLE, What that means is that, if you select widescreen, you can keep it as widescreen PERMANENTLY simply by saving your online preferences. -Mallet, Pencil, Coat, etc, selectable in CAS mode. Able to customize your cas (clientside)(Located in Deck graphic area). -Custom Create a Goal Missions. For example, you can create a race goal in create a goal, change the vehicle for the race, such as a rallycar, and have everyone in the server enter a rallycar for the race. -Vehicle sounds disappear when changing servers. -Please report any bugs you may find. 2) Users may not decompile or edit my scripts IN ANY WAY. Special Thanks to these people for helping with the mod, and giving support/advice/ideas. UPDATE: Guys, I'm ALREADY getting reports that the NEW 3 click installer FIXES ALL CRASHING ISSUES with Anteara Mod. IF YOU EXPERIENCE CRASHING, Download the new 3 click! Don't use teleports while in vehicle. I will fix this soon. If you experience crashing, very, very often - you NEED to reinstall your THUG2. I suggest reinstalling your THUG2 with the 3 click installer being released shortly. It will come preloaded with a version of Anteara Mod that is proven to be compatiable and close to bug free. PLEASE NOTE that the OLD 3 CLICK INSTALLER IS NOT COMPATIBLE WITH THIS MOD - IT WILL CAUSE CRASHES. GET THE NEW 3 CLICK. hey guy,the anteara mod crash when pauses the game,what happend? but i dont know if online gameplay, because i always stuck in "Connecting to GameSpy"..
btw, in the next version could you make the graphic looks great? like high quality shadow,texture, bloom, you know.... more HD than usual. _ENunn_ wrote: Link doesn't work.